Summary and Definition: The semi-nomadic Coeur d'Alene tribe were fishers, hunter-gatherers and traders who mainly lived mainly in villages along the St. Joe, Clark Fork, Coeur d'Alene and Spokane Rivers and also in other parts of eastern Washington, northern Idaho and western Montana. The picture, by artist Paul Kane depicts Fort Colville that was initially built using tule mats - the material the Coeur d'Alene used for their temporary summer shelters. What language did the Coeur d'Alene tribe speak? The Coeur d'Alene tribe spoke in their own native language Coeur d'Alene, a dialect of the Salishan language. The tribe called themselves Skitswish, meaning 'Those who are found here'. French-Canadian fur traders gave them their non-native name of Coeur d'Alene means "Heart of an Awl". An Awl was a tool made of bone or stone that were tapered to a point and used to punch holes in leather and wood. The name is believed to refer to the shrewdness of the Coeur d'Alene tribe's trading skills. What was the lifestyle and culture of the Coeur d'Alene tribe? The Coeur d'Alene was one of the tribes that inhabited the Columbia River Plateau living a semi-nomadic lifestyle. They spent their winters semi-subterranean pit houses and in the summer used temporary tule-mat shelters made from the reeds and bulrushes along the rivers. 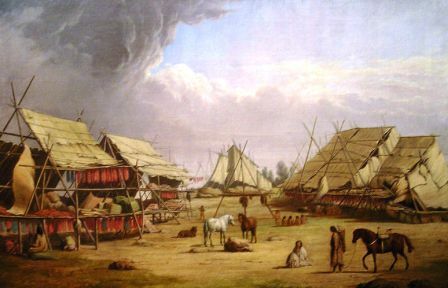 However, with the introduction of the horse, the people of the Plateau region including the Coeur d'Alene were able to travel to the Great Plains to hunt buffalo and adopted the some of the lifestyle elements of this cultural group, including the tepee, that was covered with buffalo hides, rather than tule-mats. Where did the Coeur d'Alene tribe live? The Coeur d'Alene are people of the Plateau Native American cultural group. The location of their tribal homelands was in modern day Washington, the tribe controlled additional territory in Idaho and Montana The geography of the region in which they lived dictated the lifestyle and culture of the tribe. Who were the allies and enemies of the Coeur d'Alene tribe? The allies of the Coeur d'Alene tribe were many of the other Native American Indians who inhabited the Plateau region including the Cayuse, Walla Walla, Spokane, Palouse and the Nez Perce. The main enemies of the Coeur d'Alene tribe were the Great Basin groups to the south, including the Shoshone, Blackfeet, Northern Paiute, and the Bannock tribes. The Coeur d'Alene War was caused by the white encroachment on tribal territories. The Coeur d'Alene War was fought in 1858 US Army forces in the Washington and Idaho areas, immediately following the conflicts of the Yakima War (1855-1858). The Yakima War was fought by members of the Native Indian alliance including the Cayuse, Spokane, Walla Walla, Umatilla, and Nez Perce tribes. The Coeur d'Alene War (also known as the Spokane and Palouse Indian war) was led by a Chief Vincent and a Coeur d'Alene War warrior called Milkapsi. It was fought in the Washington and Idaho areas. The Native Indian alliance consisting of the Coeur d'Alene, Yakama, Spokane and Palouse tribes attacked and defeated a force of 164 US troops under Major Edward Steptoe at the Battle of Pine Creek. Colonel George Wright was sent to subdue the tribes with 600 men. On September 1, 1858 Wright's troops defeated the allied tribes at the Battle of Four Lakes and on September 5, 1858 he defeated another force in the Battle of Spokane Plains. The ill-fated Coeur d'Alene war was over in less than four months from May 17, 1858 - September 5, 1858. What weapons did the Coeur d'Alene use? The weapons used by the Coeur d'Alene were spears, lances, clubs, knives and bows and arrows. The Coeur d'Alene also used shields for defensive purposes. What transportation did the Coeur d'Alene use? The Coeur d'Alene tribe used canoes made of strong and water-resistant birch bark that could be easily cut, bent and sewn. The birch bark canoes were important to the way of life of the Coeur d'Alene as semi-nomadic fishers and hunters. The Coeur d'Alene hollowed logs with fire and then bark was stretched over a strong, lightweight, wooden frame to make a bark canoe that could be easily steered. The canoe was perfect means of transportation for travel along fast streams and shallow waters of the Columbia River and its tributaries. What food did the Coeur d'Alene tribe eat? The food of the Coeur d'Alene tribe included salmon and trout and a variety of meats from the animals and birds they hunted. They supplemented their protein diet with roots, seeds, nuts and fruits. What clothes did the Coeur d'Alene wear? The clothes worn by the men the men and women of the tribe were similar to the clothing of the Nez Perce - please refer to this article for details. The following Coeur d'Alene history timeline details facts, dates and famous landmarks and battles fought by the Coeur d'Alene Nation. The history timeline explains what happened to the people of the Coeur d'Alene tribe. 1858: The Coeur d'Alene War (May 17, 1858 - September 5, 1858), aka Spokane, Coeur d'Alene and Palouse Indian war, was fought in the Washington and Idaho areas. 1873: President Grant ordered the establishment of the 600,000 acre Coeur d'Alene Reservation in northern Idaho.